September: the first full month of the academic year here at Franklin. Not only that, but September is arguably one of the busiest months, as starting classes and getting settled in for the semester merge with a jam-packed schedule of activities and things to do. In this post, I would like to recap some of the past month's happenings at Franklin University Switzerland. At Franklin, there is a program called Tutte Le Strade. This program occurs during each fall semester, and its name comes from the proverb “All roads lead to Rome” (Tutte le strade portano a Roma), which essentially means that various routes can be taken to obtain the same solution or result. 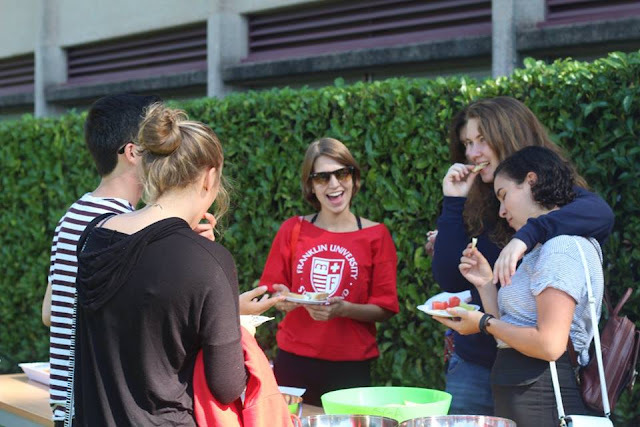 In the Franklin context, this program is comprised of a series of events intended to assist new students in successfully integrating into their lives on campus, in Lugano and in Switzerland. Most of these events are open to the entire student body as well. As you'll see in my recap, many of the events listed below are part of the Tutte Le Strade program: keep reading for an overview of September at Franklin. Opening of this year's Franklin Speaker Series featuring a lecture on the topic of Modern Diplomacy, brought to us by Ambassador Pio Wennubst, Assistant Director General and Head of the Global Cooperation Department at the Swiss Agency for Development Cooperation. A scene from the guest lecture by Ambassador Pio Wennubst. Apple McGoober — Franklin’s Open Mic Night. This event occurs on the first Tuesday of every month, encouraging student performances and creativity in a relaxed and comfortable setting. Students have been known to sing, tell stories, and recite poetry to their audience of peers. During this event, new students were introduced to some key words and phrases to help them get around in Lugano. More on this in an upcoming post! Sponsored by the Student Government Association (SGA), this annual event shows just how possible it is to develop personal connections with your professors and the staff here at Franklin, to the extent that students compete with them! My personal favorite kebab shop is located on the Italian side of Ponte Tresa (see below). However, I usually order falafel! 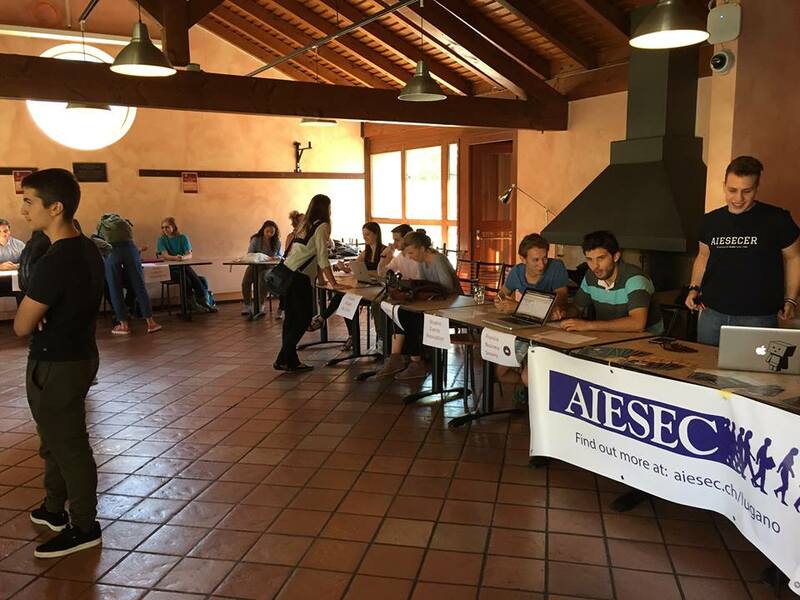 This event was organized in order to show new students where they can go cross-border shopping in Italy for less expensive groceries. 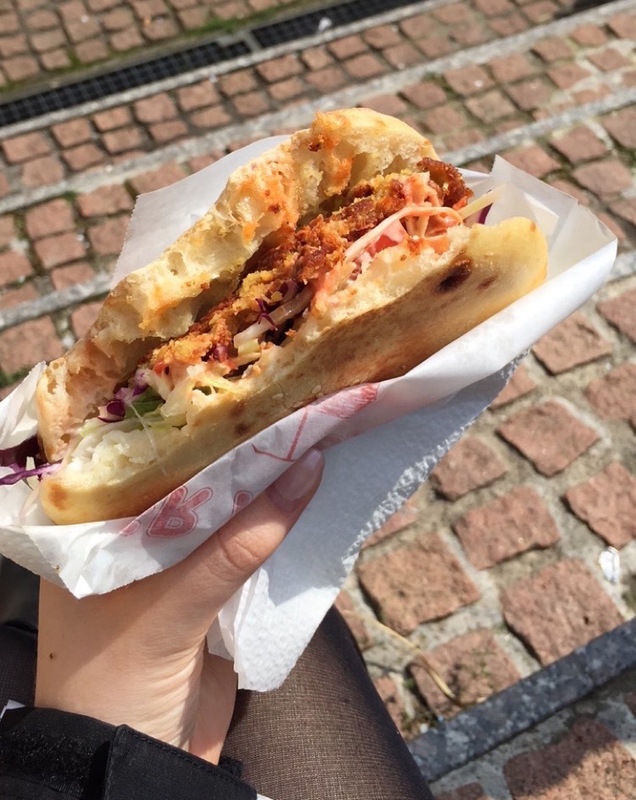 Ponte Tresa, a town hugging the Swiss-Italian border, is less than 30 minutes away and a student shopping favorite. During this program, Franklin RAs gave students the lowdown on the best ways to travel as a student. 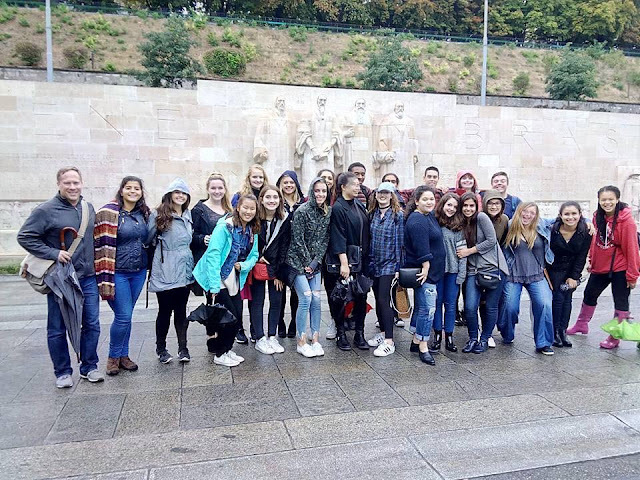 From the best ways to score cheap airfare to weekend trip lodging tips, Franklin students are experts at traveling on a student budget. What better than an event to highlight the best gelaterias around town? 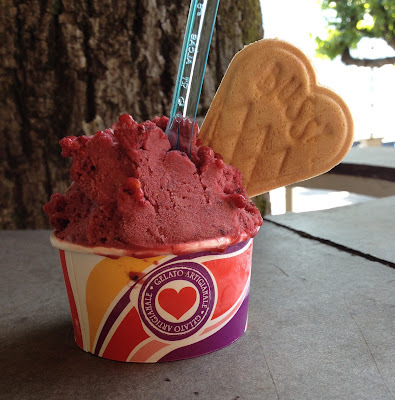 Because few things are better than good gelato. This event was held to explain the details of a couple of the career-oriented programs that exist at Franklin. Franklin Futures was developed to assist students in curating their career skills, and GoinGlobal is a database to help students find internships and jobs around the world. It is imperative that students know how to properly cite their sources. Luckily, we have several experts available at the WLC to assist with citations, editing papers, language tutoring, and more! The Fowler Learning Commons - home to the Writing and Learning Center. Romandy is the term given to the French-speaking part of Switzerland. The Swiss Bus Tour is an annual weekend event that takes students to see it for themselves. From cheese and chocolate factories to castles and the shores of Lake Geneva, this is an event that shouldn’t be missed. A photo from my own Swiss Bus Tour experience two years ago. This photo of Lake Geneva (Lac Leman) was taken from Castle Chillon. Held at the Grotto, this fair highlighted the diversity of student organizations represented on campus. Franklin Business Society, Alpine Adventure Club, Political Discourse Society, AIESEC, Lit Society, PACE, and Sustainable Agricultural Club were just a few of the groups present. Many tables were set up in the Grotto to showcase the various clubs and associations students can join at Franklin. Held by Political Discourse Society, this event was organized to help US citizens register to vote in the upcoming US presidential elections. 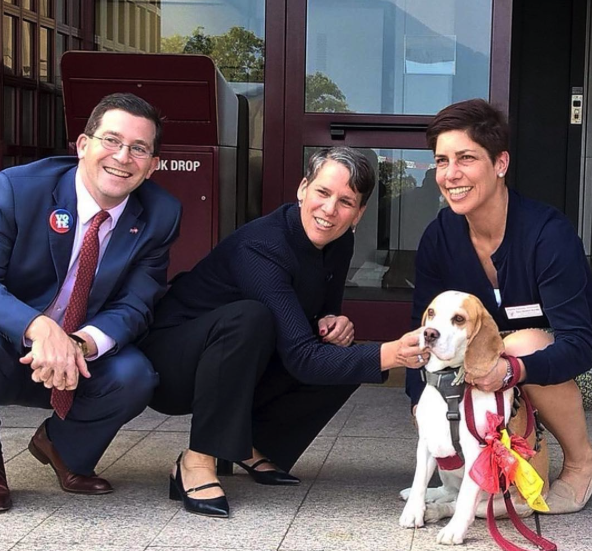 This event was organized to encourage students to get to know the Dean Sara Steinert Borella (aka: Dean SSB), Dean of Academic Affairs and Dean Deborah Knaust (aka: Dean Deborah), Dean of Student Life and Engagement in a more personal, open setting. 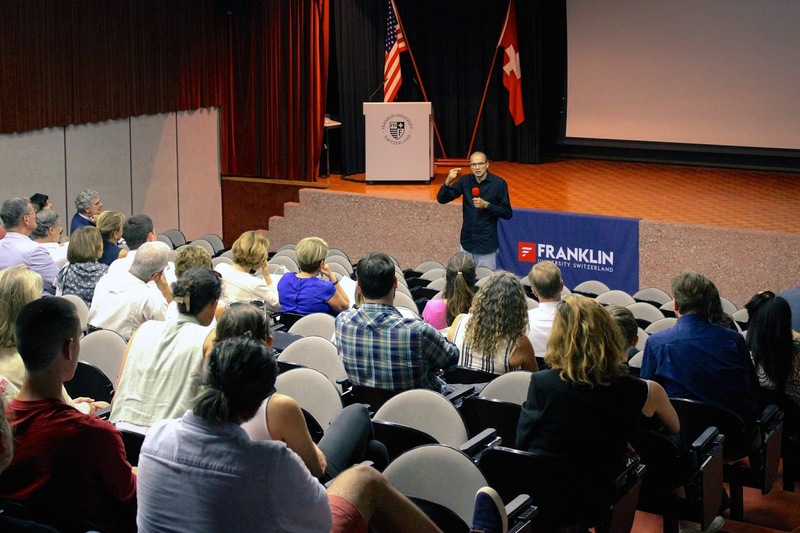 Hosted by Franklin University Switzerland for the second time, this symposium featured prominent speakers discussing cybersecurity and its challenges in today's world. Symposium speakers from left to right: Kim Hildebrandt (CEO K.N.C. 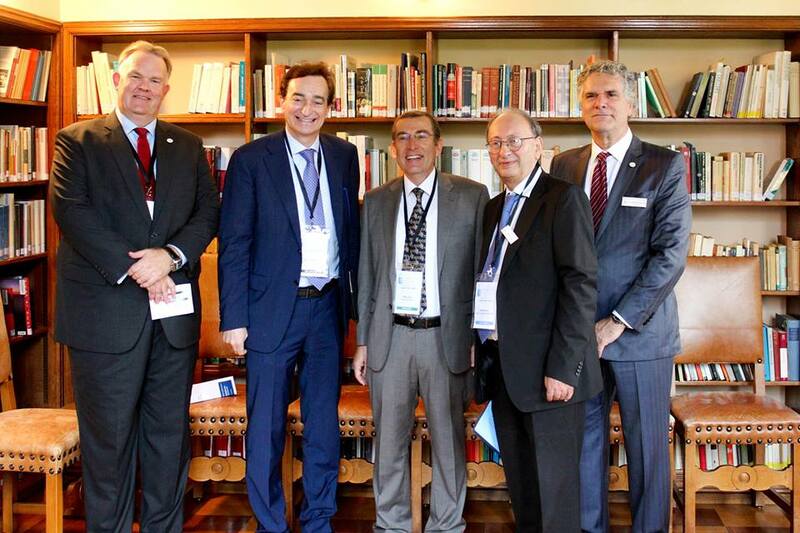 Consulting Switzerland and Chairman of the Organizing Committee), Honorable Marco Borradori (Mayor of the City of Lugano), His Excellency Jacob Keidar (Ambassador of Israel to Switzerland and Liechtenstein), Morris Mottale (Chair of the Department of International Relations and Political Science at Franklin), and Franklin President Gregory Warden. As you may or may not know, Franklin has a garden on campus. It is located behind the North Campus Villa and is tended to by members of Sustainable Agriculture Club. They organized a small sale of a variety of fresh herbs (such as rosemary and mint) that they've been growing. 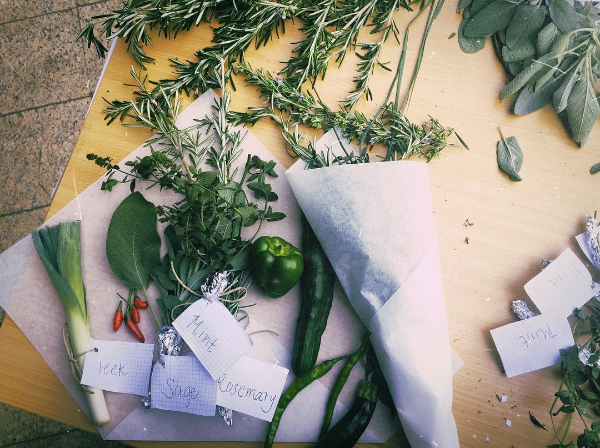 Leek, sage, mint and rosemary - just some of the greens grown on campus. Honors Society: Learned Conversation on “Who Should Decide?" Honors Society holds monthly events called “Learned Conversation.” In essence, these open conversational-style debates ask intriguing questions relevant to contemporary topics. Students are encouraged to share their opinions and experiences with others. This event is followed by a reception of cheese, crackers, and wine. Sponsored by SGA, this picnic was organized to bring students together to enjoy good food and celebrate school spirit. Students enjoyed great weather and snacks at the picnic. This event, part of the Franklin Futures program, was designed to help students showcase their experiences abroad on their resumes. As we all know, international experience is often key to today’s competitive job market. Knowing how to market yourself can make all the difference when it comes to getting a job or internship. This informal question and answers session was organized to encourage Franklin students to ask questions and get involved with the US Ambassador, whose extensive political knowledge provides a great resource. The end of September marks the beginning of Lugano’s Festa d’Autunno, or Autumn Festival. The festival is dedicated to local products and cuisine, such as polenta with stew, porcini mushrooms, roasted chestnuts, breads, cheeses, and Ticinese wines. Many vendors set up shop in downtown Lugano during the Autumn Festival. As you can see, a lot has been going on during the past few weeks! It's clear that getting involved is easy at Franklin with so many opportunities to take part in events on and off campus. If you would like, you can find out more about events at Franklin here and here. Did you find this post interesting? Let me know in the comments! I would love to hear from you.